Is your baby suffering from any microbial or skin infection? Are you looking for a natural cure for her skin infection? If you nodded along, tea tree oil is one solution you can consider. Does it have any benefits for babies? is tea tree oil safe for babies? Read our post and learn all about tea tree oil for babies and its benefits. The Tea tree, botanically popular as Melaleuca Alternifolia, is the source of tea tree oil. You need to stream and distil the twigs and leaves of Tea tree to obtain the medicinal oil. The tea tree is native to New South Wales and Southeast Queensland in Australia. However, it is available in most parts of the world. The medicinal oil possesses the ability to cure almost all ailments and infections with its disinfectant and healing properties. It is a popular household cure, particularly useful for infections in babies. Tea tree oil possesses powerful anti-bacterial properties to cure most dangerous and hazardous bacterial infections in babies. It also helps cure wounds that can lead to harmful bacterial infections effectively. Tea tree oil possesses balsamic properties that promote your baby’s overall health substantially. The oil promotes nutrient absorption capacity of your baby and safeguards her from various ailments. The oil of tea tree possesses cicatrizant property that promotes healing in babies and protects them from harmful infections. Also, the medicinal oil neutralizes or reduces the scar marks that appear post boils, chicken pox, eruptions, and other infections. 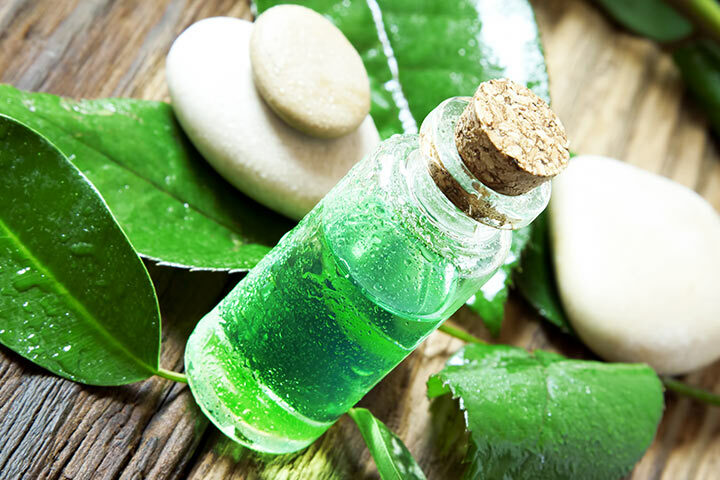 Tea tree oil kills harmful microbes with its powerful antimicrobial properties and prevents microbes, such as protozoa, from causing serious tropical fevers and malaria in babies. Babies who suffer from cold and cough, bronchitis, congestion, and various health troubles can get relief by applying some tea tree oil. Rub the remedial oil on your baby’s chest of before she sleeps, or you can add a drop of it on the underside of her pillow. Babies can suffer from problems due to the accumulation of toxins in the body. Tea tree oil is a sudorific substance, so it helps increase sweating, cleanse pores, remove toxins and drain excess water and salts substantially from your baby’s body. Tea tree oil offers a stimulating effect on blood circulation, hormone secretion and strengthens the baby’s immune system. The medicinal oil boosts the baby’s immunity and safeguards her from numerous infections and ailments. Tea tree oil is highly effective in aromatherapy for babies since it offers several internal benefits to babies. Tea tree oil minimizes muscular sprains, aches, and pain in the babies with its powerful chemical and anti-inflammatory properties. The oil improves the blood circulation in the particular affected area and promotes healing and increases the rate of growth of new cells and tissues. Did you use tea tree oil to treat any infection in your baby? How did you use it? Share your experiences here. Fellow moms would love to hear from you.